Soft tissue tumours (STT) require accurate diagnosis in order to identify potential malignancies. Preoperative planning is fundamental to avoid inadequate treatments. The role of contrast-enhanced computed tomography (CT) for local staging remains incompletely assessed. Aims of the study were to evaluate CT accuracy in discriminating active from aggressive tumours compared to histology and evaluate the role of CT angiography (CTA) in surgical planning. This retrospective cohort series of 88 cases from 1200 patients (7 %) was locally studied by contrast-enhanced CT and CTA in a referral centre: 74 malignant tumours, 14 benign lesions. Contrast-enhancement patterns and relationship of the mass with major vessels and bone were compared with histology on surgically excised samples. Sensitivity, specificity, positive and negative predictive values (PPV, NPV) were evaluated in discriminating active from aggressive tumours. Sensitivity in differentiating aggressive tumours from active lesions was 89 %, specificity 84 %, PPV 90 %, NPV 82 %. The relationship between mass and major vessels/bone was fundamental for surgical strategy respectively in 40 % and in 58 % of malignant tumours. 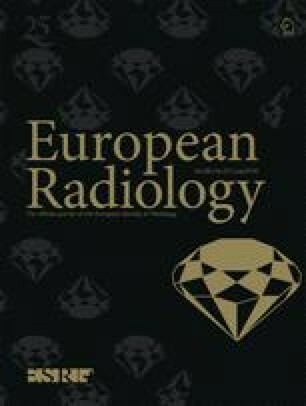 Contrast-enhanced CT and CTA are effective in differentiating aggressive masses from active lesions in soft tissue and in depicting the relationship between tumour and adjacent bones and major vessels. • Accurate delineation of vascular and bony involvement preoperatively is fundamental for a correct resection. • CT plays a critical role in differential diagnosis of soft tissue masses. • Contrast-enhanced CT and CT angiography are helpful in depicting tumoral vascular involvement. • CT is optimal for characterization of bone involvement in soft tissue malignancies. The scientific guarantor of this publication is Faletti Carlo. The authors of this manuscript declare no relationships with any companies, whose products or services may be related to the subject matter of the article. The authors state that this work has not received any funding. One of the authors has significant statistical expertise. Institutional Review Board approval was obtained. Written informed consent was obtained from all subjects (patients) in this study. No study subjects or cohorts have been previously reported. Methodology: retrospective, observational, performed at one institution.